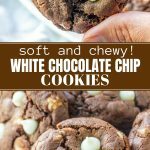 Chocolate White Chocolate Chip Cookies are soft, chewy and double the chocolate! 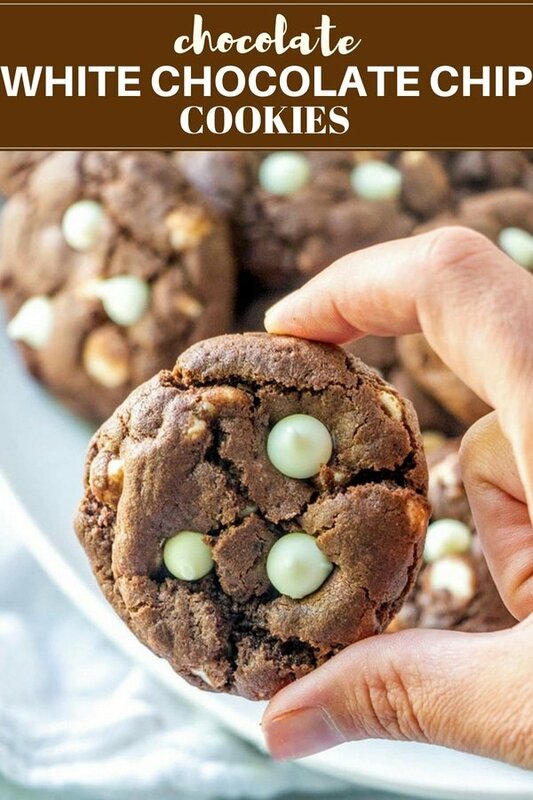 They make a scrumptious baked treat and are always a crowd favorite! We are in the middle of a Back-to-school mini-series here on the blog, and although these chocolate white chocolate chip cookies may not be cutesy as the School Bus Rice Krispies treats from yesterday or the Composition Notebook-inspired cupcakes from the day before, they’re actually the perfect addition to our list! 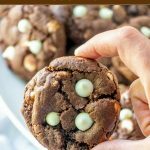 Soft, chewy and loaded with chocolate taste, the kids will love these cookies tucked in their lunch pails or to have waiting when they get home from school along with a glass of cold milk for dunking! 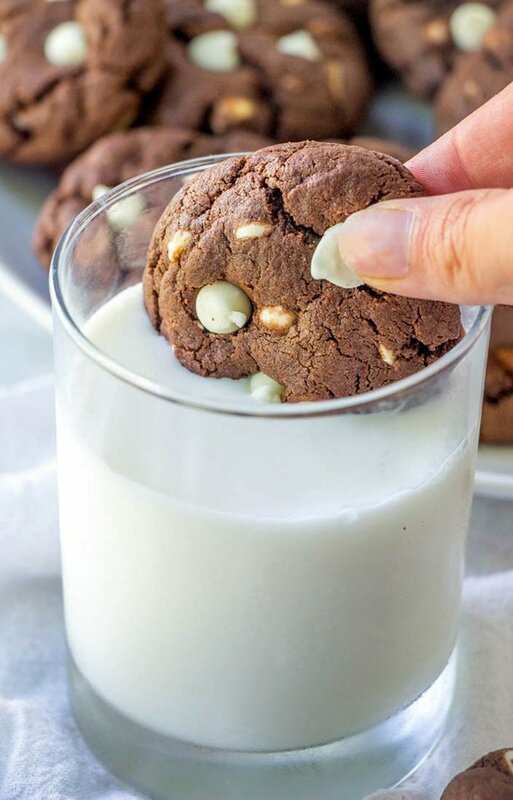 For soft and moist cookies, measure the flour correctly as adding more than what the recipe calls for will make the cookies dry and hard. Scoop the flour into the cup and then level it out. 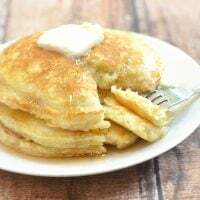 Do not overwork the batter. Mix just until the dry ingredients are moistened. Soften the butter at room temperature and do NOT microwave! You can instead grate the butter if you want it to soften quicker. 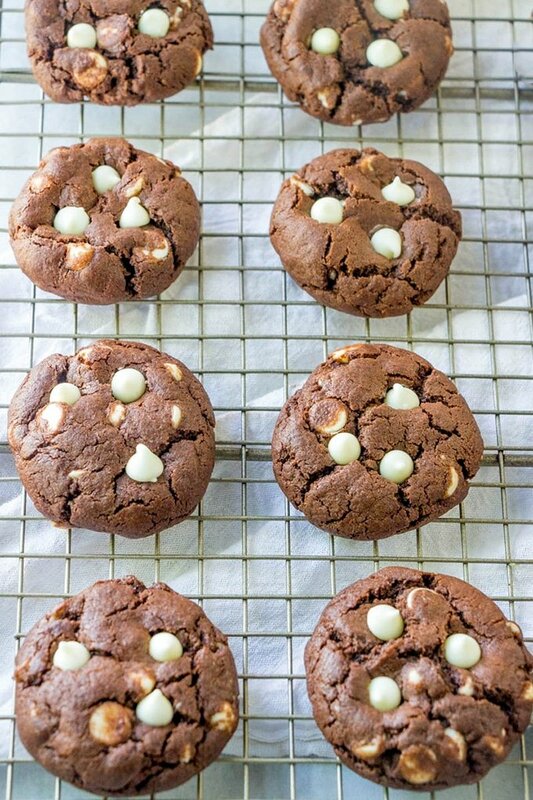 Use high-quality chocolate and check the baking soda for freshness. Place one teaspoon baking soda in one cup hot tap water; if it bubbles up it’s good to use. 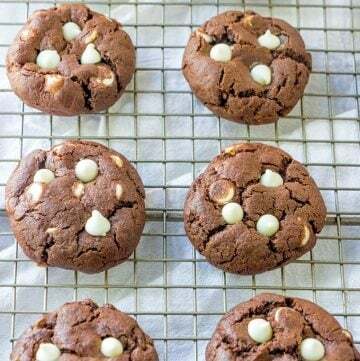 Make sure the baking sheet is at room temperature as a warm pan will melt the dough and make the cookies spread out thin. If you’re baking in batches and using the same pan, allow it to cool between rounds by running under tap water. Do not overbake the cookies. 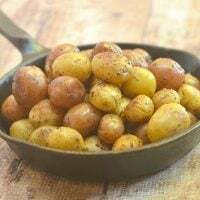 They will continue to bake in the residual heat so remove from the oven when edges are golden and the centers are still soft but are just cooked through. 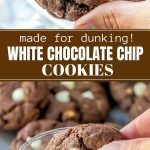 This white chocolate chip cookie recipe makes 4 dozens and as much we love them to pieces, we can’t possibly go through the whole batch in one sitting. To store for future use, allow them to cool completely, layer wax paper between each cookie, and store in airtight containers. They’ll keep at room temperature for up to 3 days or in the freezer for up to 3 months. To enjoy, let sit at room temperature for about 10 to 15 minutes. 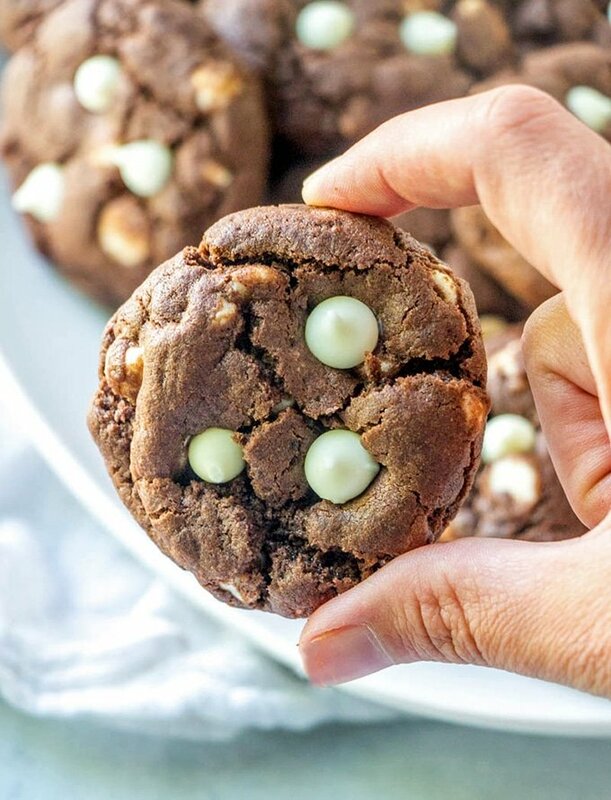 Bake up a batch of these chocolate white chocolate chip cookies today; they’re perfect for any time sweet cravings as well as holiday gift giving. They’re sure to be a favorite of kids and adults alike. 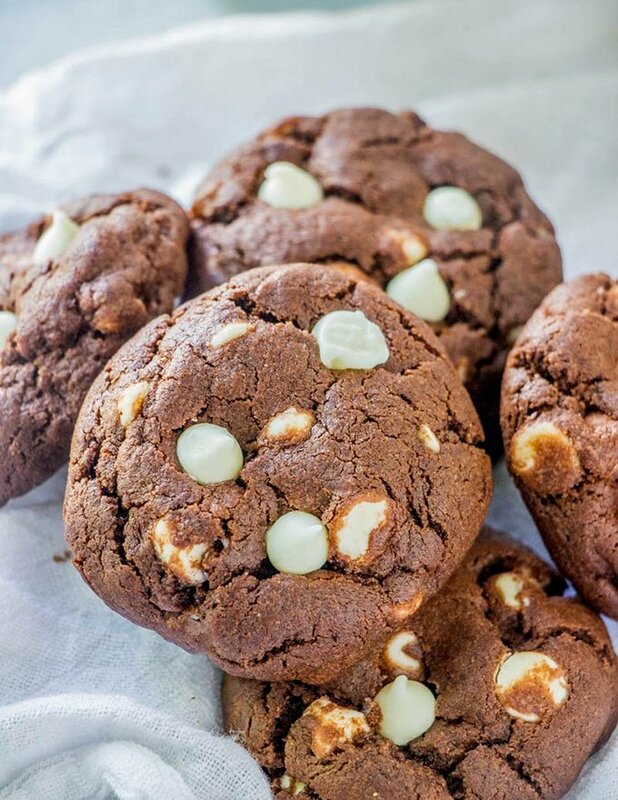 Want more chocolatey cookies? 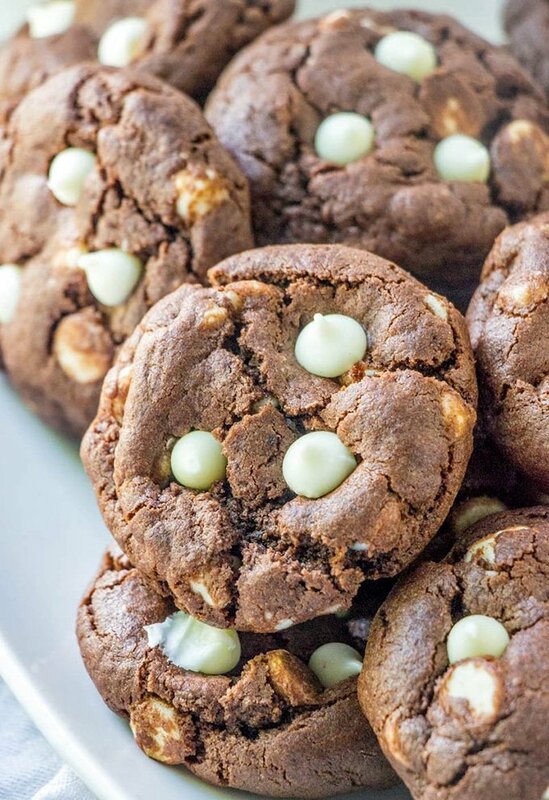 These Mrs. Fields Double Rich Chocolate cookies are just as scrumptious! Let’s meet up here again tomorrow; I have a whole line up of fun food and crafts for you. If this back-to-school stuff is not your thing, check out my recipe index for other delicious meal ideas. In a small bowl, combine flour, cocoa, baking soda, and salt. Whisk well to distribute. 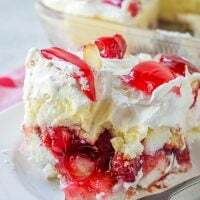 In a large bowl, beat butter, granulated sugar, brown sugar, and vanilla extract with an electric mixer at low speed until smooth and creamy. Gradually add flour mixture to butter mixture, beating to combine (dough will be stiff). Using a #16 scoop or a tablespoon, drop dough on ungreased baking sheet about 2-inches apart. Bake in a 350 F oven for about 9 to 10 minutes or until edges are set (centers will be slightly soft). Remove from oven, cool for about 1 minute and transfer to a wire rack to cool completely. I love that you post also the Nutrition facts in your posts! I’ll try and make those, I have to find lactosefree chocolate first! You can dark chocolate chips if you like. Your photos are great! Makes me wanna grab that or i mean those cookies and just gobble them up. 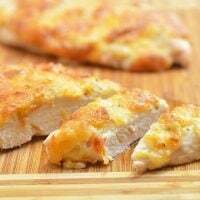 Please do step by step pictures of your recipes, i really love looking at them.thanx!